Wise Care 365 Pro is an all-in-one and easy to use system maintenance application that that will keep your Windows in tiptop shape and running at peak performance. There are countless numbers of system care and cleaning utilities available but Wise Care 365 Pro managed to stand out from the rest thanks to its dead easy use interface, blazing fast speed, and overall effective health care for your PC. 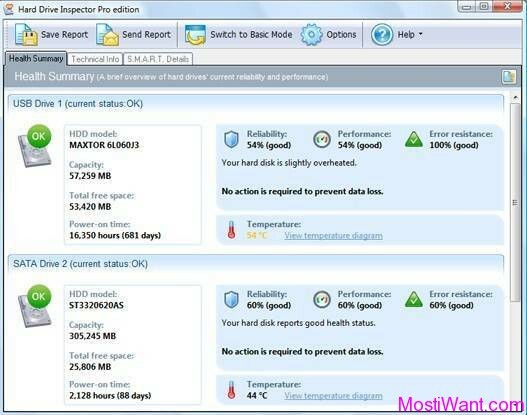 Absorbed all the features of highly praised Wise Registry Cleaner and Wise Disk Cleaner, along with a cornucopia of system utilities, Wise Care 365 Pro contains every tool that you need to bring your computer in good health and keep it like that. 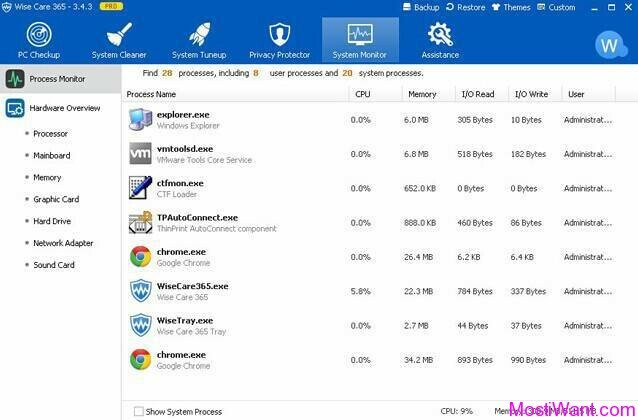 The main window is neatly arranged and consists of 5 tabs including PC Checkup, System Cleaner, System Tuneup, Privacy Protector and System Monitor. By default you’re gonna see the Full Check Up tool. 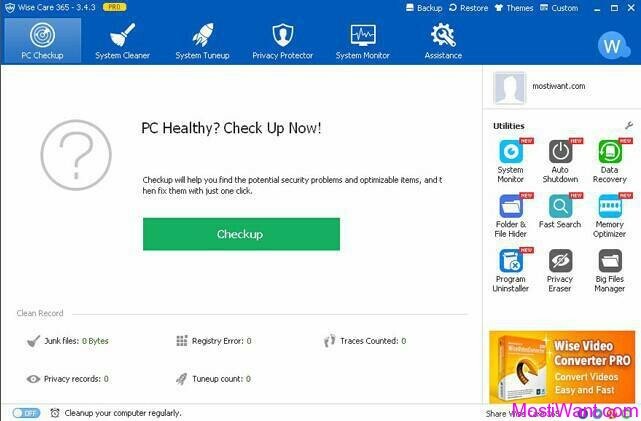 PC Checkup checks the whole running condition of your PC and help you find the potential security problems and optimizable items, and then shows you quick-fix solutions. PC Checkup uses 10 scores as the full mark to rate your PC’s health status. 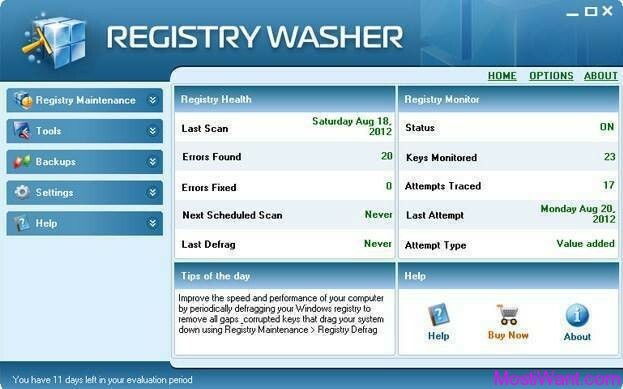 The System Cleaner tab offers a total of 5 tools intended for cleaning the registry and common files, doing an advanced cleaning as well as freeing up system drive space by getting rid of unnecessary Windows files such as downloaded installation files, installer baseline cache, IME, help files, wallpaper files, sample music/pictures/videos/media of Windows (system sliming). It also manage big files. 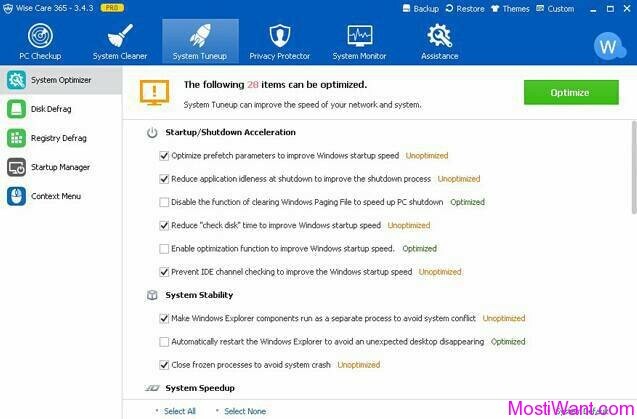 System Tuneup optimizes system and and network, defragments disk and registry, and manages startup software & services and context menu. 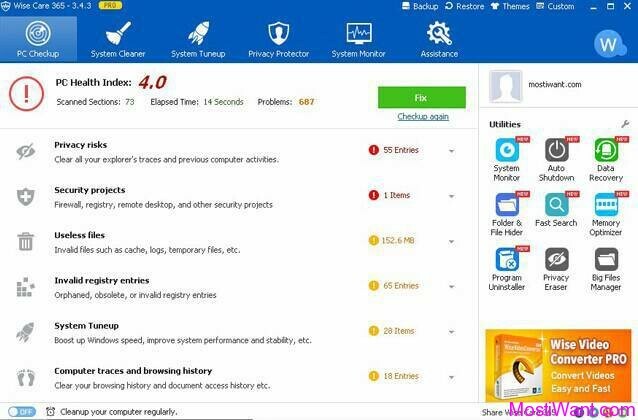 Privacy Protector will erase your browsing history such as the viewed pictures, watched movies/videos, accessed files and visited pages, prevent files or data from being recovered by recovery software, generate all kinds of passwords for you and show the security degree of your password. Prying eyes have no ways to get close to you at all. System monitoring is a new added feature to not only monitor the process but also display the detail information of your hardware such as mainboard, graphic card, memory and so on. What’s more, you will find the speed up ball which can display the memory usage and CPU temperature. 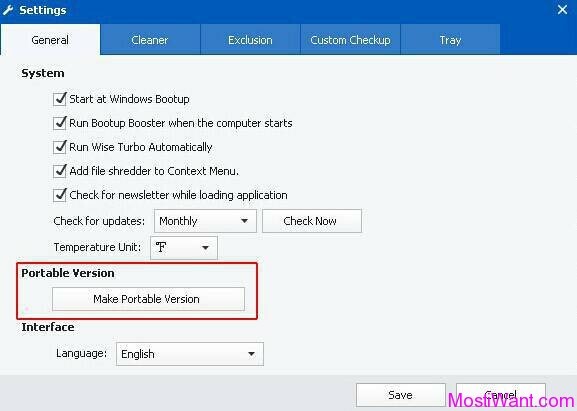 In addition, a portable version can be created easily and automatically just by few clicks ( Main Window > Custom Menu > Settings > General >Make Portable Version. 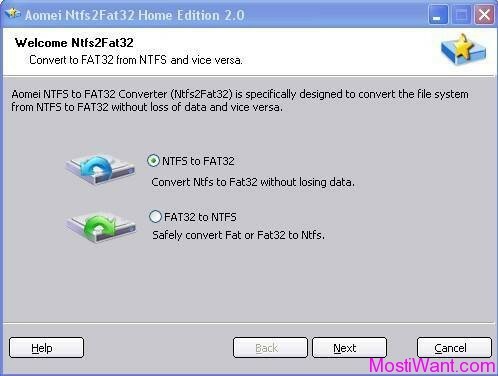 Another important feature is the ability to create a backup, namely either a complete system restore point or a full registry backup. 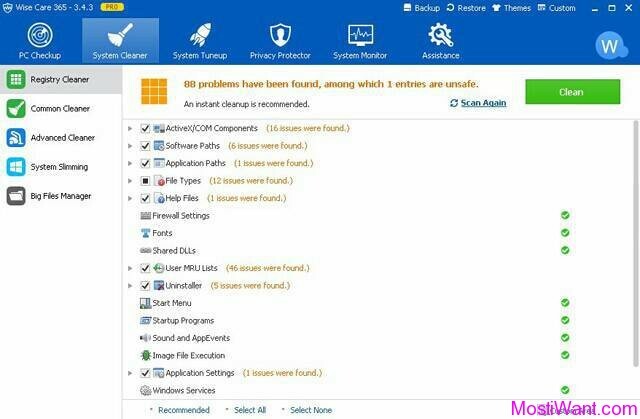 You can restore your registry from a backup file or a system restore point when some unplanned or unexpected registry issues appear. These backups allow you to undo any of the changes. All in all, as a tuneup utility, Wise Care 365 Pro is comprehensive and full-featured, practical and economical. It will keep your PC in tiptop shape and at peak performance. Enjoy it! Wise Care 365 Pro normally charges $39.95 per serial key (1 year subscription for up to 3 PCs, discounted to $29.95 right now). But in cooperation with the developer, we can offer Wise Care 365 Pro 3.92.351 completely FREE (lifetime license without free upgrade) to our visitors for the next 72 hours (giveaway valid from 11 to 13 of December). Download your free copy using this direct link. This is special MostiWant giveaway version with inbuilt serial key. Just download and install. It will automatically active full version. You can use full version free for life but no free upgrade and tech support! Just to be on the extra safe side it is recommended that you create a System Restore point before you trying out this software. This will help restore your PC to an earlier state in case something ever goes wrong in the future. At last, Thanks Vivian @ WiseCleaner.com Team for taking interest in to this blog and arranging the Giveaway for my readers. Thanks William. This program is quite good as it allows me to keep in rein programs that attach themselves to the context menu. Also works nicely with windows 10. Thank you both, Vivian and William, for the useful giveaway. Thanks Very Much for this exclusive special gift. Thanks MostIwant Webmaster. Thanks WiseCleaner. Just a heads up, as of Feb 2, it looks like Google now say’s wisecleaner.com “This site may be hacked.” and website is down. Thanks. Have reported this to wisecleaner. BTW, the giveaway package download from mostiwant.com is clean and free of virus. Updated: issue fixed. Google no longer marks it as hacked.